When I am on a diet, (who am I kidding, I'm always on a diet) my weight loss plan starts to falter when I get a craving for something crunchy and salty. I'm not talking about raw fruits and veggie type of crunchy, I'm talking about potato chip crunchy. If I ignore this craving, it just gets stronger; does that sound familiar to anyone? I did some online searching for a remedy to my craving that wouldn't have a billion calories. I found three different recipes for baked potato chips that sounded promising. After trying all three (and immediately tossing all three into the garbage), I decided to make up my own version. I must say I'm quite pleased with it. Not only does this little recipe completely satisfy my "crunchy chip craving" but the ENTIRE RECIPE only has one tablespoon of olive oil!! Wash and dry six golf ball size Yukon gold potatoes. Slice them as thin as possible. A mandolin would work well for this, but I just used my sharpest knife and sliced them; just try to make them all an even thickness. Toss the sliced potatoes with 1 tablespoon of olive oil, making sure that a little of the oil gets in between every slice. 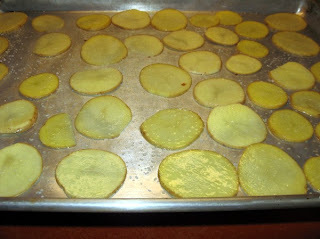 Lay the slices out on a heavy cookie sheet that has been lightly sprayed with vegetable spray, then sprinkle the potatoes lightly with kosher salt. Baking time is important. One of the recipes I tried (and threw away) called for 2 hours at 200°F. That produced a dull, leathery piece of potato. I even let it cook an extra HOUR and it was still leathery...yuck. Another recipe called for 18 minutes at 400°F which produced a crisp but burnt taste...yuck again. So I decided to try Yukon gold potatoes. How long you bake them will depend on how thick you sliced your potatoes and how hot your oven runs. I baked mine in a 375°F electric oven for 22 minutes, flipping them over half way through the baking time....just right. 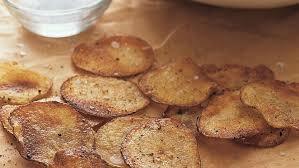 These chips are meant to be eaten right away because they are not meant to be stored like a commercial potato chip. There are small "non-crunch" parts on the chips that would not store well. I hope you will try these. They have a WONDERFUL flavor and a fantastic, salty crunch!!! NOTE: Watch the chips closely the last couple of minutes because once they start to turn golden, they darken quickly.